After losing his hearing due to an ototoxic antibiotic, musician Richard Reed was unable to appreciate music—or even have a so-called "normal" conversation—for nearly ten years. Then he had CI surgery in 2002. At lectures and performances Richard demonstrates how music, voices, and nature sounds through his CI. Once again, he is playing organ and piano in Blues and Rock & Roll bands. 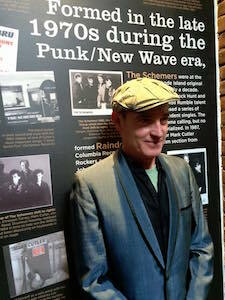 He was inducted into the Rhode Island Music Hall of Fame in 2015. It is my honor to share Richard's story in our blog. While searching our cluttered basement, I came across boxes full of reminders from my first- and worst- decade of late-deafened adulthood. Thanks to Cochlear Implant surgery and rehabilitation, I've been able to hear again, and quite well, for fourteen years. Why had I held on to this stuff? Why had I shlepped those musty memories along through three moves? There's no good reason. We let go when we're ready. One carton was mostly wires wrapped around obsolete assistive listening devices and gadgets; another held hopeful articles on hearing loss breakthroughs and a small stack of my dismal audiograms. In the years before the deluge of virtual journalism, family and friends used to send me stories about grieving and loss. It's funny and poignant to see my long-gone mom's elegantly eccentric handwriting scrawled across a tragic tale: "Saw this and thought of you!" One folder contained ads for Ginkgo Biloba and other tinnitus treatments and "cures", an expired warranty for state-of-the-art analogue hearing aids, and a thick catalogue offering amplified telephones as big as old phone books. Contemplating having to sort the contents into four piles (keep, toss, recycle or Salvation Army), I whispered sarcastically "This will be fun!" Then I smiled to realize that when I'd packed most of this stuff, I couldn't have heard myself say anything. There were only two post-CI mementos in the lot: the first and only CD I ever bought, "Rubber Soul" by The Beatles and a hardcover copy of "Walden" by Henry David Thoreau. I've written elsewhere about how foolish it feels in retrospect to have attempted The Beatles as my first post-CI music. Although very familiar and sorely missed, those songs were way too harmonically rich, their production too sonically dense. They're actually enjoyable again now, but it's strange that "Nowhere Man" is less than three minutes long. It seemed a lot longer a few days after CI activation. I tried listening to it two or three tortuous times, but knew right away it wasn't going to work. So I walked to the nearby library to look at audiobooks. My father had been re-reading Walden before he died. I'd held on to his copy meaning to at least crack its cover, if not all of its secrets. But I hadn't taken the time to do either. Finding Walden among the Narragansett Library's audio books—knowing I had that old hardcover at home to read along with—felt like a sign from above. Like its ancient namesake pond, the 19th century tales in Walden are beautiful and deep. So it's probably best if their narrator doesn't sound like a 21st century robot chipmunk. Thoreau once said, "Read the best books first, or you may not have a chance to read them at all." A caveat for beginner CI users: Read along while listening to simple audiobooks at first, or you may not be able to listen for more than a paragraph or two. Returning to the library, I swapped Walden for The Witches by Roald Dahl. It was light-hearted. Its narrator used a few different accents which only sounded sillier in Early CI Robot Chipmunk English. Much better. Fast forward back to the basement: those old boxes were heavy, literally and figuratively. 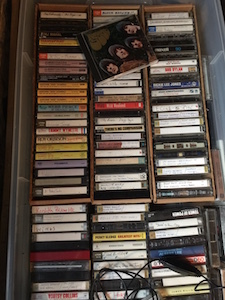 At the very bottom of the pile was a mislabeled under-the-bed storage container full of sweeter memories: favorite cassette tapes from before I lost my hearing. Wow! There were a few thousand great old songs. And if I'm only able to enjoy hundreds and hundreds of them due to the inherent Lo-Fi of CI, that's still an amazing grace. I'm glad I hadn't tossed them out in a quiet fit of melancholy while still deaf. Except for the sentimental things and the memories they trigger, all the information in those old boxes---the books and articles, the music on antiquated tapes, the obsolete technology of my land-line relay telephone, even my medical records—can now fit in a device smaller than one of those old cassettes. I was pondering that when the lights went out. "Oops, sorry", I heard Emily shout from three basement rooms and a staircase away/ "I didn't know you were down there!" Being able to hear my girlfriend's faraway voice didn't feel particularly special at the time. CI users grow accustomed to everyday aural miracles. It's only in remembering and writing it down now that I feel the weight of it, like a warm comforter on a cold night. I really should spend more time just being amazed. "What are you doing?" Emily asked from the stairway. "Looking for a cassette player," I replied.